A news website in Cumbria is one of five hyperlocal sites to have received a £10,000 grant from the Carnegie Trust. 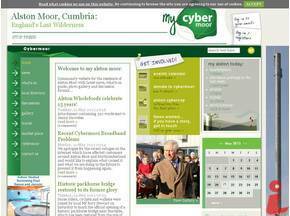 Cybermoor, a community website for the residents of Alston Moor, was set up in 2003 as a co-operative project and also operates a wifi broadband network and other services for locals. Alston Moor is home to just over 2,000 people and at 1,000ft above sea level, is the highest market town in England. The Cybermoor site was chosen from nearly 80 applicants across the UK and Ireland to become a Carnegie Partner in the ‘Neighbourhood News’ initiative. It is managed by Sue Gilbertson. Carnegie’s senior policy officer Douglas White said: “The way we consume our news has changed hugely in recent years. Much of the content we now access comes from online sources, including online newspapers, Twitter and Facebook, while traditional sources of news have been under pressure. We are concerned that the supply of local news is particularly under threat. “If people can’t access news about their local area then this creates a dangerous democratic deficit. The Neighbourhood News project was established to help test new models of delivering local news to meet demand. “We received some fantastic applications from projects where local groups are producing great news outlets and creating a real sense of belonging for communities. The four other recipients of the grant were the Port Talbot Magnet in South Wales, Your Thurrock in Essex, the Brixton Blog in London and Whale Arts in Edinburgh.